We ran a post last week, Fine Dining in Berkshire that was very well received – so much so that some of our members have asked us to replicate the article for other regions. 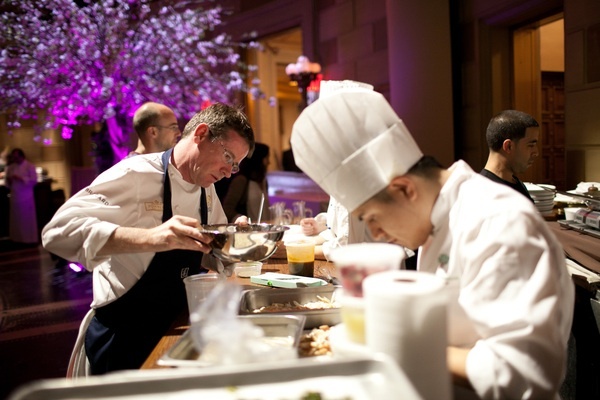 At Design Restaurants we like to please – our motto is not so much “To Fly, To Serve” more “To Eat, To Serve”! With that in mind we have taken ourselves up to the top of the UK and have looked at the incredible wealth of choice available for fine dining in Scotland. Forgive us for we know Scotland is a country not a region but our recommended restaurants are rather spread out across the landscape taking in both city and country. As with our last article we started with what Michelin recommends in this area and without a doubt the favourite of the Red Guide is Andrew Fairlie, the Scottish born chef patron of the eponymous restaurant Andrew Fairlie at Gleneagles, the only two Michelin star restaurant in Scotland. Ranking 18th in the Sunday Times top 100 restaurants, Fairlie uses local produce with classical French training for deceptively simple dishes. Other accolades include AA Chef’s Chef of the Year and One of the World’s top 10 Hotel Restaurants by Hotel Magazine back in 2002. 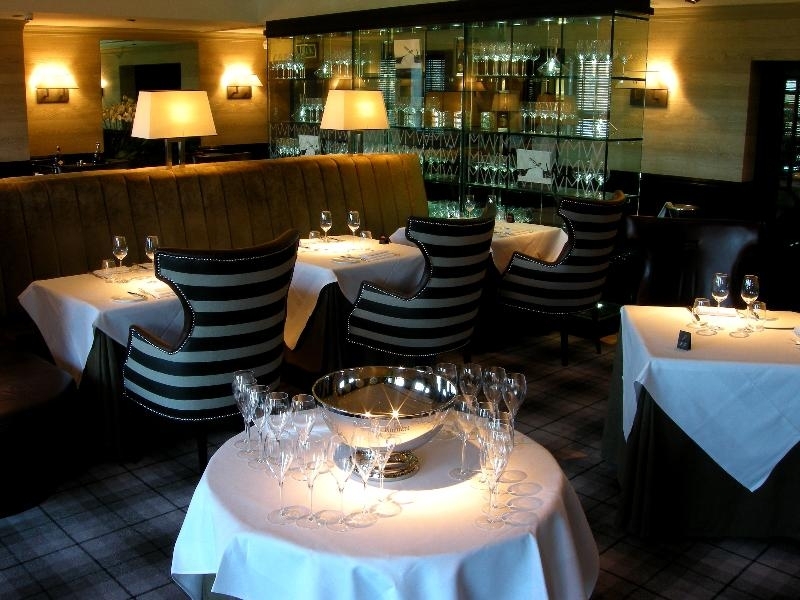 The restaurant is calm and sophisticated, occupying a quiet corner of the Gleneagles Resort in Perthshire, and just formal enough to create a sense of occasion. He uses classic white table cloths, diffused lighting, soft and light chenille furnishings and lively paintings hung dramatically on dark coloured walls. Aged twenty, Andrew was awarded the first Roux Scholarship, offering him the opportunity to train with legendary chef Michel Guerard at Les Prés d’Eugénie in Gascony, profoundly influencing his culinary approach. 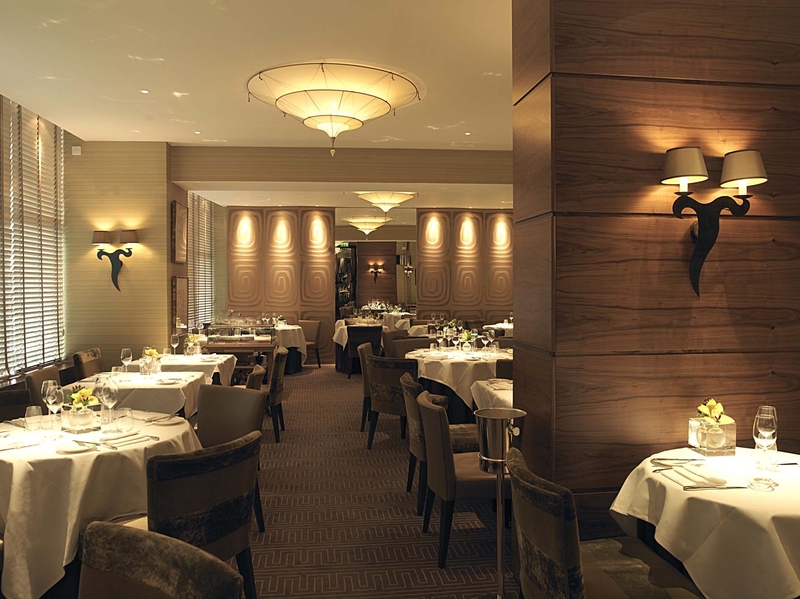 In January 2006 Restaurant Andrew Fairlie became one of only eleven restaurants in the UK to be awarded two Michelin stars. Perhaps one of Scotland’s finest and most highly awarded hotel and restaurants, Inverlochy Castle’s pedigree is almost as awe inspiring as its location. At the foothills of Ben Nevis and overlooking its own loch, Queen Victoria once said “I have never seen a lovelier or more romantic spot”. Once there you can savour the excellent British cuisine of Philip Carnegie and his brigade, with the impressive restaurant credentials of having held a Michelin star every single year since 1982! 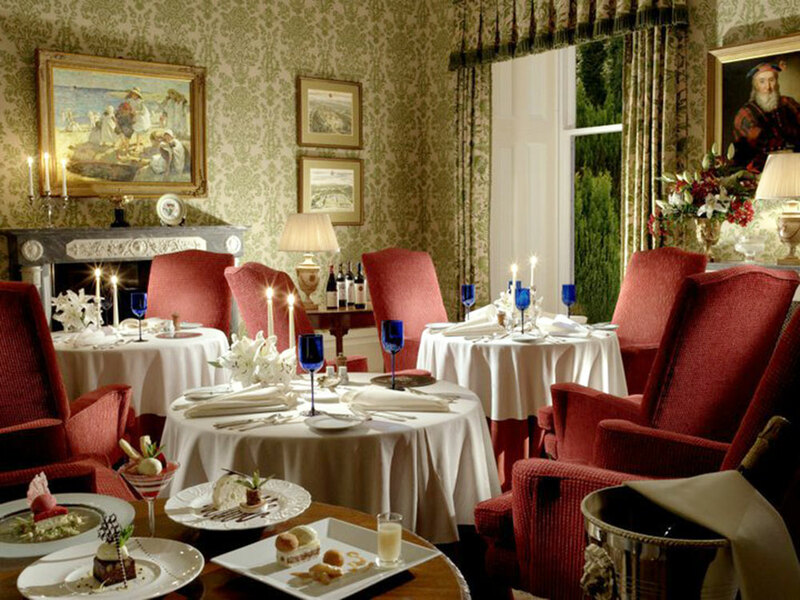 Decor is grand Scottish Castle with period pieces and dining at Inverlochy is an experience to savour in any of the three dining rooms, each decorated with elaborate furniture presented as gifts to Inverlochy Castle from the King of Norway. House and gardens by renowned Edwardian architect Sir Edwin Lutyens, cuisine by legendary French chef Albert Roux for Chez Roux. 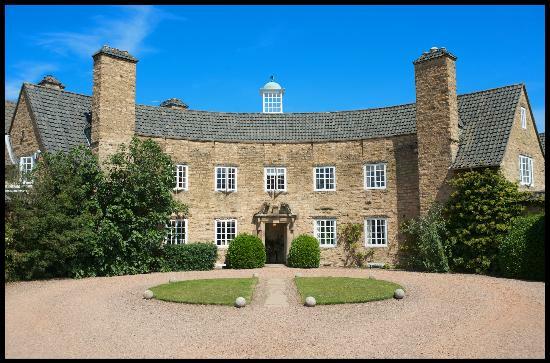 The country house to escape to for a romantic rendezvous or for golfing aficionados for its views over Muirfield greens. Style is classical and true to its roots with recent refurbishments undertaken by interior designer, Kathleen Fraser. Chez Roux, opened in May 2010 to great acclaim, boasts French classical cuisine with a flair and lightness, using local produce as much as possible and it is excellent value. Martin Wishart has been instrumental in the development of fine dining in Scotland since 1999 when he opened his first restaurant in Edinburgh, Restaurant Martin Wishart which won a Michelin star in 2001 and has retained it ever since. It is now one of the UK’s most acclaimed dining venues with Martin and his team continuing to make an impression and Martin now probably the most prominent chef cooking in Scotland today. The cuisine is modern French, using the finest Scottish ingredients – surely a match made in foody heaven?! The restaurant was refurbished in 2012 and is elegantly hushed in mocha and cream tones with considered lighting casting a gentle glow. Early in his career Martin Wishart actually worked as a chef de partie at the sit of Cameron House, now named Martin Wishart at Loch Lomond. This restaurant has also undergone a complete makeover by Martin Wishart house designer Ian Smith. The idea has been to create an elegant and stylish, but relaxed and calming environment where guests can feel at ease. Encouraging them to be fully open to the fine dining experience and enjoy the spectacular mountainside beauty of Loch Lomond. The cooking has been called ‘artistry of the highest order’ and with a tasting menu priced at £195 one would hope so! 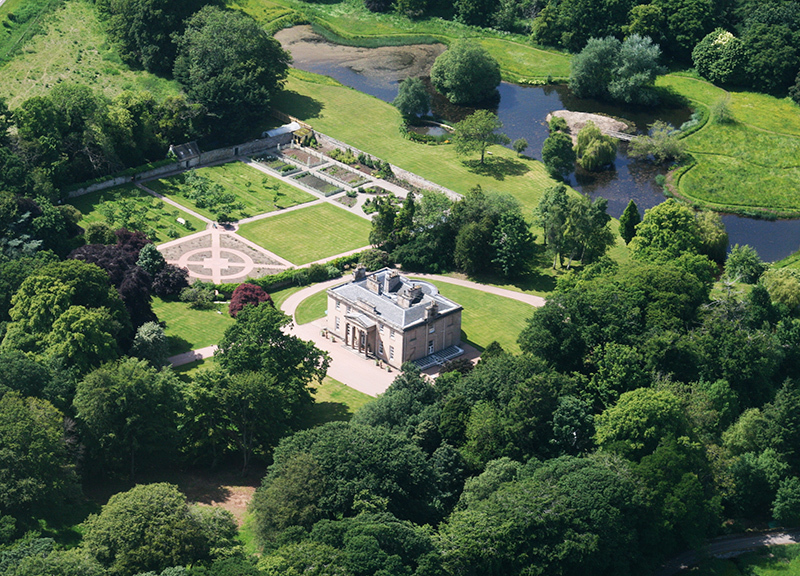 This beautiful property was once on the endangered list until it was rescued in the 1990’s and returned to its original historic Georgian splendour. Awarded a coveted Michelin star, Boath House’s philosophy includes organic fruit and vegetables from their own kitchen gardens, honey from their own bees and an eclectic wine list. Floor to ceiling windows, set in the curved wall of the dining room frame the idyllic view of the willow on the lake. The ambiance changes as the sun sets behind the trees and the flickering candlelight takes precedence. 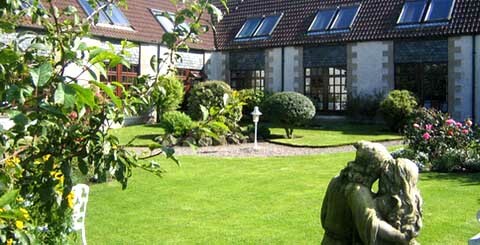 The Peat Inn is owned by award winning Chef and columnist Geoffrey Smeddle and his wife Katherine, who have successfully built on its very fine reputation as one of Scotland’s most cherished destinations. Geoffrey was formerly head chef at Etain, Sir Terence Conran’s first destination restaurant outside London and he and his team in the kitchen focus on delivering modern cooking based on the finest local and seasonal ingredients. This simple approach is complemented by the exciting wine list of over 400 bins. The Inn has existed on this spot since the 1700s. Today, the Michelin starred restaurant with rooms continues to welcome guests who appreciate the special and very personal experience which is the hallmark of The Peat Inn. Three small dining rooms make up the restaurant, providing an intimate setting for lunch or dinner. The reception lounge with its deep sofas and open log fire, creates an atmosphere which is elegant and refined and made all the more enjoyable by the friendly and attentive service. 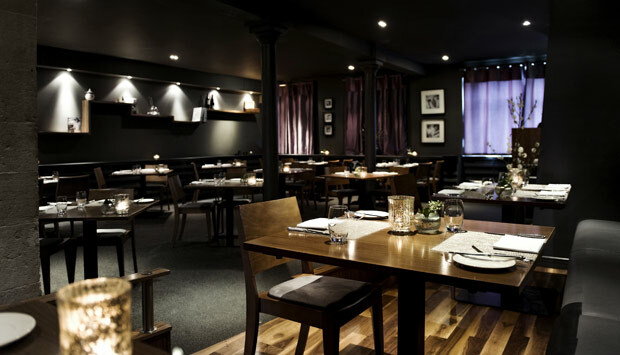 Tom and Michaela Kitchin opened their restaurant, The Kitchin on Edinburgh’s Leith waterfront in 2006. The restaurant was awarded a Michelin star in 2007 followed by numerous prestigious awards including ‘Best UK Restaurant 2011’ and ‘Best Restaurant in Scotland 2012’.The Kitchin presents modern British seasonal cuisine influenced by French cooking techniques and an appreciation of the best quality ingredients available from Scotland’s fantastic natural larder. The restaurant’s philosophy ‘From Nature to Plate’, is a true reflection of Tom’s passion for the finest, freshest Scottish seasonal produce and the cooking at the restaurant reflects Tom’s training under some of the world’s best chefs blended with his own Scottish heritage. Chez Roux at Rocpool Reserve – Inverness’ ultra chic and multi award winning boutique hotel in the heart of the city with Albert Roux’s first Chez Roux opened in Scotland. James Miller Room at The Turnberry – The James Miller Room offers an intimate and elegant dining experience. Here, the emphasis is on locally sourced ingredients, prepared and presented with a tireless dedication to craft. Inverlodge & Chez Roux Restaurant – An adored retreat for gourmets for its Chez Roux Restaurant to unwind and relax in with the sheer spectacle of the natural environment offering endless explorations afterwards. Scotland has much to offer in the way of fine dining and we have no way covered all of its jewels so we will be revisiting to recommend some more in a few weeks time! We are also waiting in baited anticipation of the opening of Andy Murray’s Cromlix. Design Restaurants members receive benefits at many of the restaurants listed above. For more information on membership please go to www.designrestaurants.com. Fantastic blog – great to see some stuff written about the incredible restaurants Scotland has to offer at last! Many thanks for highlighting them and have bookmarked this for future reference and to prove to doubters that Scotland offers much to gourmets! Thanks gg – and we’ve got more to come!